This is the photograph of the Annual General Meeting of our Cooperative Society. I was one of the board of directors there and had to share stage with eminent personalities. More then 600 members were expected to attend the AGM. It was very confusing for me to select a outfit for such a meet. 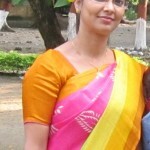 Then my husband suggest to wear this gorgeous silk saree which he gifted me on the occasion of marriage of his cousin. I was still confused but when i drape it, it was a great surprise to myself also that i got myself in the real attire which was accurately suited for the grand occasion. Now i felt myself fully confident and staged the board with full zeal.